The context path of a web application defines the URL that end users will access the application from. A simple context path like myapp means the web app can be accessed from a URL like http://localhost:8080/myapp. A nested context path like myapp/v1 means the web app can be accessed from a URL like http://localhost:8080/myapp/v1. Tomcat provides a number of ways to define the context path of a web app, although the configuration is not quite as straight forward as you might expect. In this blog post we'll explore the various options Tomcat provides for deploying web applications and defining their context paths. Many of the options available in Tomcat for deploying applications are defined in the <Host> element in the config/server.xml file. We'll explore how these attributes affect deployments in Tomcat below. There are two ways to deploy Java web applications. The first way is to deploy a WAR file. A WAR file is just a ZIP archive with a directory structure that is recognised by Java application servers like Tomcat. WAR files are convenient because they are a single package that is easy to copy, and the contents of the WAR file are compressed making it quite a compact package. The second way is to deploy all the individual files that make up a web application. This is called an exploded deployment, or an exploded WAR. This kind of deployment can be very useful during development, as files like HTML pages and CSS files can be edited while the application is deployed, and reloaded on the fly. By default when you deploy a WAR file to Tomcat, it will be extracted into an exploded deployment for you. In the screenshot below you can see that the end result of deploying a file called demo.war is a directory called demo with the context of the demo.war archive extracted into it. This behaviour can be disabled by setting the unpackWARs attribute on the <Host> element to false, in which case the WAR file will not be unpacked as part of the deployment process. The webapps directory is where deployed applications reside in Tomcat. The webapps directory is the default deployment location, but this can be configured with the appBase attribute on the <Host> element. If Tomcat is set to autodeploy applications (and it is set to do this by default) then any WAR file or exploded deployment copied into the webapps folder will be deployed automatically while Tomcat is running. The autodeployment of applications can be disabled by setting the autoDeploy attribute on the <Host> element to false. In this case applications will de deployed on startup. In turn the deployment of applications on startup can be disabled by setting the deployOnStartup attribute on the <Host> element to false. If both autoDeploy and deployOnStartup are false, then you can deploy applications by manually adding a <Context> element inside the <Host> element in the conf/server.xml file. See the section "Defining the Context in the server.xml File" for an example. 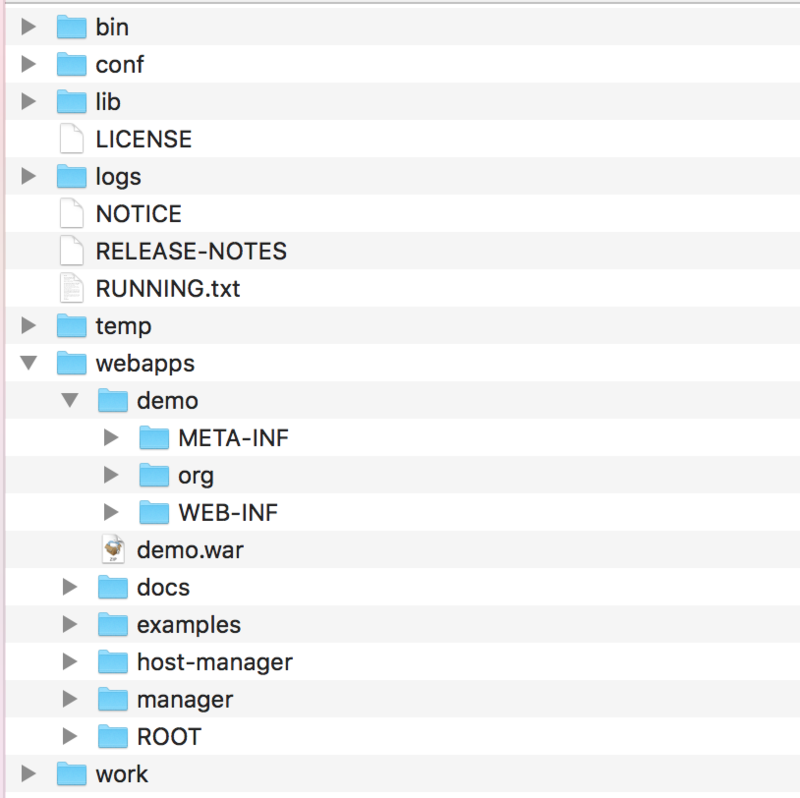 When an application is deployed from the webapps directory, it will be made available under a context path that matches the name of the WAR file, or the name of the directory under webapps that the exploded deployment was copied to. For example, if you deploy an WAR file called demo.war, it will be made available under the demo context. Likewise if you deploy an exploded war to webapps/demo, it too will be made available under the context of demo. Tomcat supports nested context paths. These are embedded in the WAR filename after a single hash character. For example, if you deploy a WAR file called demo#v1.war, it will be made available under the demo/v1 context. Contexts can be multiple levels deep, so if you deploy a WAR file called demo#v1#myfeature.war it will be made available under the demo/v1/myfeature context. The same pattern applies to the directories holding exploded deployments. For example, if you deploy an exploded war to webapps/demo#v1 it will be made available under the demo/v1 context. The docBase attribute is a path to the WAR file or exploded deployment directory. It is relative to the webapps directory, although an absolute path can be used. The path attribute is the one that we are most interested in, as it defines the context path of the application. In this case we have exposed the web app under the /mydemo/version1 context. The path attribute can only be defined if the WAR or exploded deployment directory is not under the webapps directory, or if the autoDeploy and deployOnStartup attributes on the <Host> element are false. In this example we are referencing the file webapps\demo#v1.war, which means that the autoDeploy and deployOnStartup attributes on the <Host> element must be false. If this rule is not followed, double deployment is likely to result. Defining <Context> elements in the server.xml file is not considered best practice. This information should be defined in files saved under conf/Catalina/localhost/. See "The Confusing Case of the context.xml File" for more information. From the name of the WAR file or the exploded deployment directory. From the path attribute on the <Context> element in the server.xml file (with the caveat that the application being deployed is not located under the webapps directory, or if it is under the webapps directory that the autoDeploy and deployOnStartup attributes on the <Host> element are false). Tomcat also allows us to include a file in our web app called META-INF/context.xml, or to create the file conf/Catalina/localhost/<context>.xml under the Tomcat directory. These files contains the same <Context> element as the <Host> element in the server.xml file. This naturally leads you to assume that you can define the path attribute on the <Context> element in these XML files, and Tomcat will deploy the application to the defined context path. For example, let's assume that the following XML is saved as the META-INF/context.xml file inside a WAR file called demo#v1.war. When the demo#v1.war file is placed in the webapps folder and deployed by Tomcat, it will be made available under the demo/v1 context. The path attribute is ignored. Likewise if that same XML context was saved to the conf/Catalina/localhost/demo#v1.xml file, the application would still be made available under the demo/v1 context. [The path] attribute must only be used when statically defining a Context in server.xml. In all other circumstances, the path will be inferred from the filenames used for either the .xml context file or the docBase. What this means is that it is the name of the WAR file or exploded deployment directory, or the name of the XML file under conf/Catalina/localhost, that defines the context path. Indeed when creating an XML file under the conf/Catalina/localhost directory for the purposes of defining the context of an application deployed from the webapps directory, the XML file needs to have the same name as the WAR file or exploded deployment directory. For example, if you have a file called webapps\demo#v1.war, then the corresponding XML file must be called conf/Catalina/localhost/demo#v1.xml. So these files need to have matching filenames, and the filename defines the context. When configuring the context for a deployment outside of the webapps directory, the docBase attribute has to be defined. This attribute points to the WAR file or exploded deployment. In this case it is still the name of the XML file that defines the context. For example, if the XML below is saved to conf/Catalina/localhost/application#version1.xml, the application from /apps/myapp#v1.war will be made available under the context application/version1. The WAR filename is not used to generate the context in this case. Finally the context path of an application can be defined while uploading it through the manager REST API. This can be done with a PUT request to http://localhost:8080/manager/text/deploy?path=/foo, where the request data is the WAR file to be deployed, and the path query parameter is the desired context path. Requests to /manager/html require the credentials of a user from the manager-gui group. This URL is the one you access to view the Manager app via a web browser. Requests to /manager/text require the credentials of a user from the manager-script group. This URL is considered to be the Manager API. It is recommended to never grant the manager-script or manager-jmx roles to users that have the manager-gui role. This file upload will result in a deployment with context path embedded in the file name inside the webapps folder. So actually uploading a file via the Manager app is not a new way to define the context of an application, it is just a convenient way to ensure a correctly named web application is copied into the webapps directory. This table summaries the various context paths that will be assigned to web applications deployed from webapps, referenced in the server.xml file, or referenced from a file under conf/Catalina/localhost/.